Virtual reality and shopping collide to provide eBay customers a world-first new VR shopping experience, and the future is now no longer about e-commerce, but v-commerce, says eBay’s CMO and senior director of retail innovation, Steve Brennen. 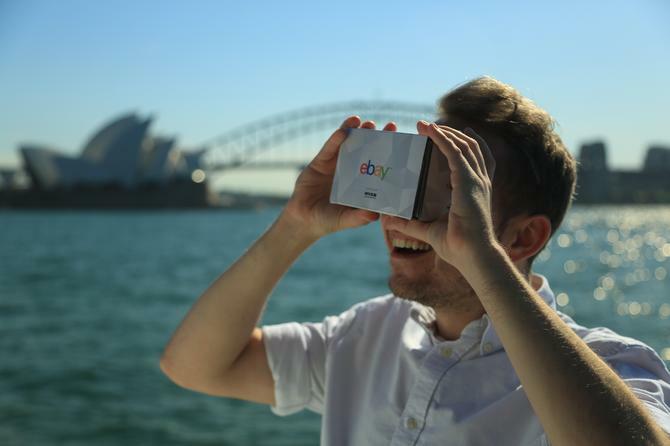 Making the grand reveal in partnership with Myer, eBay launched the pioneering technology that allows Australian customers to browse more than 12,500 products using eBay’s new gaze recognition technology, Sight Search. Following a 12-month development phase, the virtual reality department store now connects to the existing eBay site, which can be accessed by a new eBay VR Department Store app. Once the app is downloaded, customers then place their smartphones in a set of ‘shoptical’ VR glasses to start the shopping experience. According to Brennan eBay, wanted to take the best of the physical experience and the digital experience and embrace a new channel to address these opportunities in the virtual world. He said the new VR department store is not limited to floor, wall or shelf space or location. Customers can get up close and personal in a 3D way with products that no web experience could ever deliver, he claimed. Brennan predicts soon we’ll see seamless transactions, social shopping and true personalisation – all in the virtual world. A powerful function of the new VR technology is the ability to capture customer data, which Brennan says is far more significant than what you can capture on traditional digital platforms. With VR, Brennen says retailers can quickly learn what customer like and don’t like and track customer interests and preferences to then offer a far more personalised experience. It is this personalisation that Brennan believes will be the real game changer in the virtual world, as it will mean a truly individualised shopping journey. The rollout was not without its challenges. Brennen said his team had to carefully consider what experience eBay wanted to deliver, considering nothing like this had ever been offered before. Another challenge was rendering physical products into 3D for the virtual world, which Brennen said is difficult considering there are currently very few tech players offering these services on the market. Brennen said eBay has been thrilled to partner with Myer on the new VR rollout and believes you need to collaborate with smart people who believe about innovation to drive a project of his scale to reality. The move follows another recent partnership with Woolworths and the new ‘click and collect’ option for shoppers. Moving forward, Brennen believes brands will not only need to look into an e-commerce strategy, but a v-commerce strategy to keep customers engaged. “VR will no longer be a separate retail channel but a complimentary channel added into the retail mix,” he added. “We know this technology is a game changer and we are very proud to be driving it from Australia. The technology is now accessible to all Australians with eBay’s giveaway of 15,000 free shopticals. Customers are invited to explore the experience and provide feedback as part of the next phase of the technology’s development.